Join us for a special holiday Mixer! 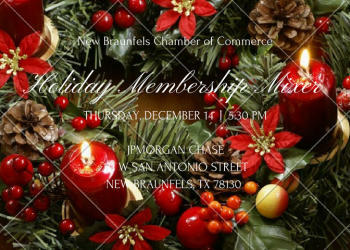 The December Membership Mixer will be held at JPMorgan Chase on Thursday, December 14 from 5:30 to 7:30 p.m. This is your chance to meet other Chamber members and mingle with community and business leaders while enjoying good food, cold drinks and tons of holiday spirit. And don’t forget about the cash and prizes! We’ll draw for a cash prize of $100 for one lucky Chamber member. We’ll also have door prizes from our sponsors to give away. But remember, you must be present to win. So join us for food, fellowship and fun, and maybe you’ll even walk away with some extra cash in your pocket! REMEMBER to bring your Membership Card to present at the registration table for entrance into the Mixer. Join us for a fun evening with food, drinks and networking with your fellow chamber members and the business community. JPMorgan Chase is located at 111 W San Antonio St on the plaza in downtown. The Mixer is sponsored by Capitol Wright Distributing, LLC, Huisache Grill, and McAdoo’s Seafood Company.